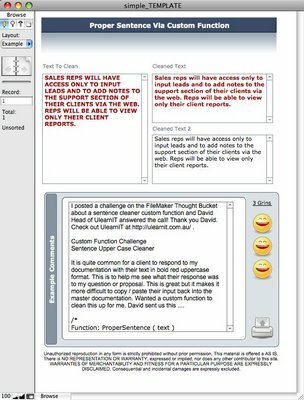 A scant two days ago, I posted a challenge on the FileMaker Thought Bucket about a sentence cleaner custom function and David Head of UlearnIT answered the call! Thank you David. Check out UlearnIT at http://ulearnit.com.au/ . Purpose: changes a string of text into proper sentences where the first character after a full stop (period) is capitalised and all other characters are lowercase.